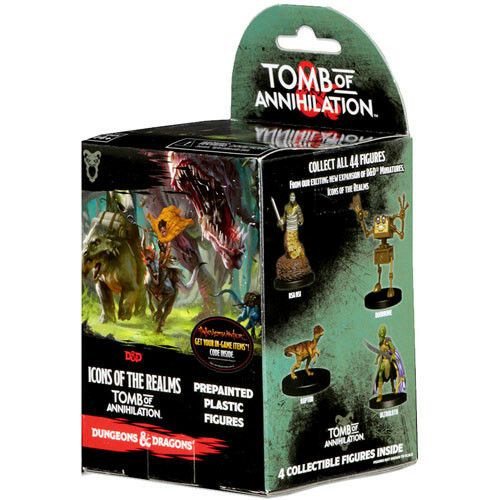 Collect all 44 figures from the Tomb of Annihilation, the seventh set of randomly sorted monsters and heroes in the exiting line of D&D miniatures, Icons of the Realms. Extra-planar evil is trapping the souls of the dead with a "Death Curse". Manifesting within the realm as a terrible plague, it is a slow, withering rot that takes hold of any soul who has been restored by divine intervention. Adventurers are sought out and sent to the jungle peninsula of Chult, where they must face all manner of dangers in order to find the lost city. Adventurers will need all the help they can get to get through the tomb and the dungeon's evil architect - the Lich Acerbak. Is there anyone who can survive the tomb and defeat its evil architect?